, earl of Peterborough, was the son of John lord Mordaunt, of Reygate, in Surrey, and lord viscount Avalon, in the county of Somerset, by Elizabeth, daughter of Thomas Carey, second son of Robert, earl of Monmouth. He was born about 1658; and, in 1675, succeeded his father in honours and estate. In his youth he served under the admirals Torrington and Narborough in the Mediterranean, during the war with the state of Algiers; and, in June 1680, embarked for Africa with the earl of Plymouth, and distinguished himself at Tangier, when it was besieged by the Moors. In the reign of James II. he was one of those lords who manifested their zeal against the repeal of the test-act; and, disliking the measures and designs of the court, obtained leave to | go over into Holland, to accept the command of a Dutch squadron in the West-Indies. On his arrival, he pressed the prince of Orange to undertake an expedition into England, representing the matter as extremely easy; but, his scheme appearing too romantic, his highness only promised him in general, that he should have an eye on the affairs of England, and endeavour to put those of Holland in so good a posture as to be ready to act when it should be necessary: assuring him at the same time, that if the king should proceed to change the established religion, or to wrong the princess in her right, or to raise forged plots to destroy his friends, he would try what could possibly be done. 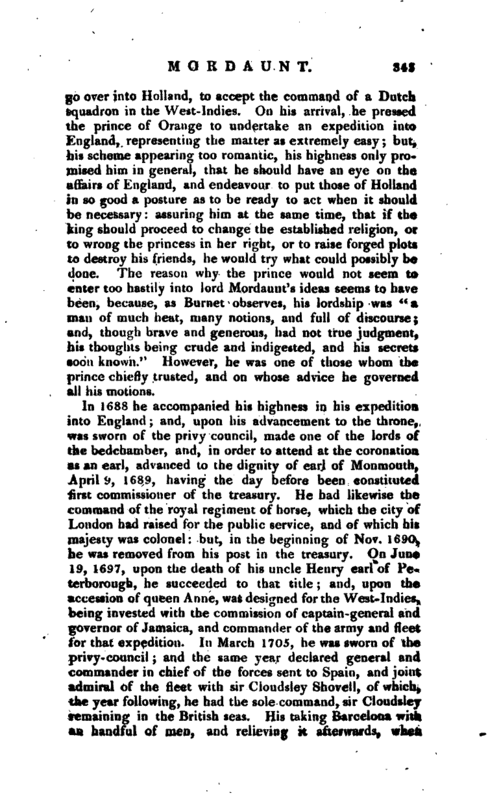 The reason why the prince would not seem to enter too hastily into lord MordauntV ideas seems to have been, because, as Burnet* observes, his lordship was “a man of much heat, many notions, and full of discourse; and, tjiough brave and generous, had not true judgment, his thoughts being crude and indigested, and his secrets soon known.” However, he was one of those whom the prince chiefly trusted, and on whose advice he governed all his motions. In 1688 he accompanied his highness in his expedition into England; and, upon his advancement to the throne, was sworn of the privy council, made one of the lords of the bedchamber, and, in order to attend at the coronation as an earl, advanced to the dignity of earl of Monmouth, April 9, 1689, having the clay before been constituted first commissioner of the treasury. He had likewise the command of the royal regiment of horse, which the city of London had raised for the public service, and of which his majesty was colonel: but, in the beginning of Nov. 1690, he was removed from his post in the treasury. On Juno 19, 1697, upon the death of his uncle Henry earl of Peterborough, he succeeded to that title; and, upon the accession of queen Anne, was designed for the West-Indies, being invested with the commission of captain-general and governor of Jamaica, and commander of the army and fleet for that expedition. In March 1705, he was sworn of the privy-council; and the same year declared general and commander in chief of the forces sent to Spain, and joint admiral of the fleet with sir Cloudsley Shovell, of which, the year following, he had the sole command, sir Cloudsley remaining in the British seas. His taking Barcelona with an handful of men, and relieving it afterwards, when | greatly distressed by the enemy; his driving out of Spain the duke of Anjou and the French army, which consisted of twenty-five thousand men, though his own troops never amounted to ten thousand; the possession he gained of Catalonia, of the kingdoms of Valencia, Arragon, and Majorca, with part of Murcia and Castile, and thereby giving opportunity to the earl of Galway of advancing to Madrid without a blow; were all astonishing instances of valour, prudence, and conduct in military affairs, and, together with his wit, ready address, and singularities of character, made him be considered as one of the ablest servants of the public, and one of the most extraordinary characters of his time. For his services abroad his lordship was declared general in Spain by Charles III. afterwards emperor of Germany; and, the war being thought likely to be concluded, he was appointed by queen Anne ambassador extraordinary, with power and instructions for treating and adjusting all matters of state and traffic between the two kingdoms. The king of Spain, however, having transmitted some charges against him, his conduct was examined by parliament, and cleared up to their entire satisfaction. 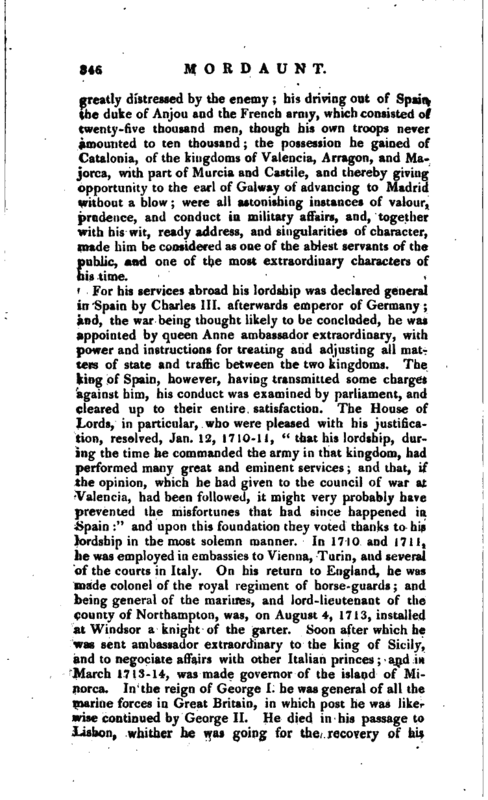 The House of Lords, in particular, who were pleased with his justification, resolved, Jan. 12, 1710-11, “that his lordship, during the time he commanded the army in that kingdom, had performed many great and eminent services; and that, if the opinion, which he had given to the council of war at Valencia, had been followed, it might very probably have prevented the misfortunes that had since happened in Spain:” and upon this foundatiorrthey voted thanks to his lordship in the most solemn manner. In 1710 and 1711, Jie was employed in embassies to Vienna, Turin, and several of the courts in Italy. On his return to England, he was made colonel of the royal regiment of horse-guards; and being general of the marines, and lord-lieutenant of the county of Northampton, was, on August 4, 1713, installed at Windsor a knight of the garter. Soon after which he was sent ambassador extraordinary to the king of Sicily, and to negociate affairs with other Italian princes; and in March 1713-14, was made governor of the island of Minorca. In the reign of George I. he was general of all the marine forces in Great Britain, in which post he was liker wise continued by George II. He died in his passage to Lisbon, whither he was going for thp recovery of his | health, Oct. 25, 1735, aged seventy-seven. 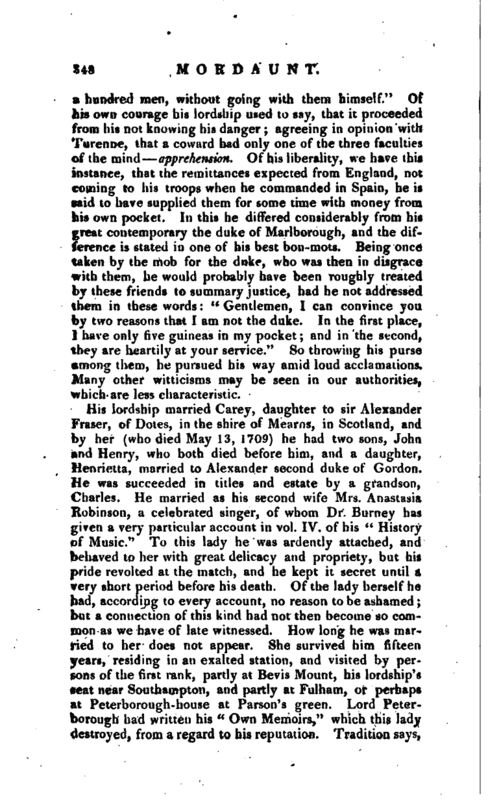 A very interesting account of his last illness, which was excruciating, js given in vol. X. of Bowles’s edition of Pope’s Works. 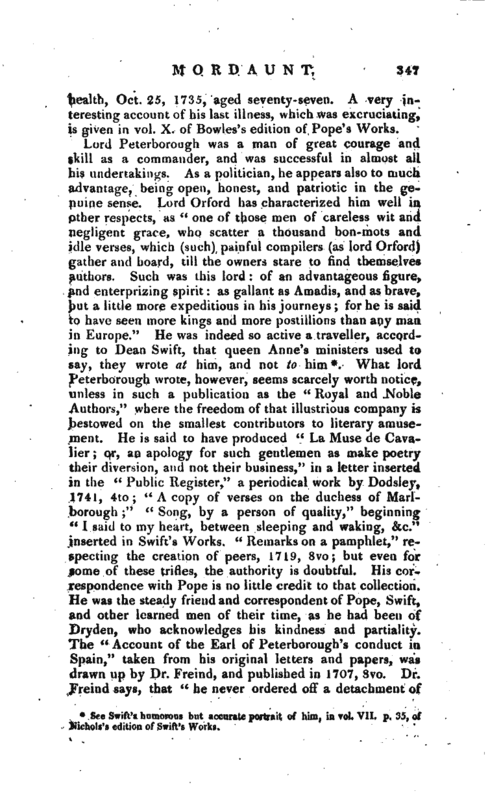 * See Swift’s humorous but accurate portrait of him, in vol. VII. p. 35, of Nichols’s edition of Swift’s Works. | a hundred men, without going with them himself.“Of his own courage his lordship used to say, that it proceeded from his not knowing his danger; agreeing in opinion with. Turenne, that a coward had only one of the three faculties of the mind apprehension. Of his liberality, we have this instance, that the remittances expected from England, not coming to his troops when he commanded in Spain, he is said to have supplied them for some time with money from his own pocket. In this he differed considerably from his great contemporary the duke of Marlborough, and the difference is stated in one of his best bon-mots. Being once taken by the mob for the duke, who was then in disgrace with them, he would probably have been roughly treated by these friends to summary justice, had he not addressed them in these words:” Gentlemen, I can convince you by two reasons that I am not the duke. In the first place, I have only five guineas in my pocket; and in the second, they are heartily at your service." So throwing his purse among them, he pursued his way amid loud acclamations. Many other witticisms may be seen in our authorities, which are less characteristic. 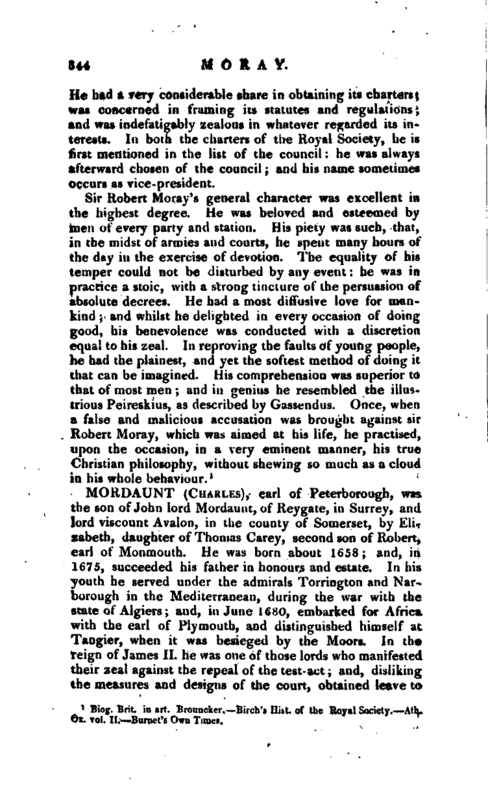 Birch’s Lives to the Illustrious Heads Collins’s Peerage by sir E. Brydges. Walpole’s Royal and Noble Authors by Park Capt. Carleton’s Memoirs, lately republished. Sv? ift’s and Pope’s Works, by Nichols and Bowies; see the respective Indexes. 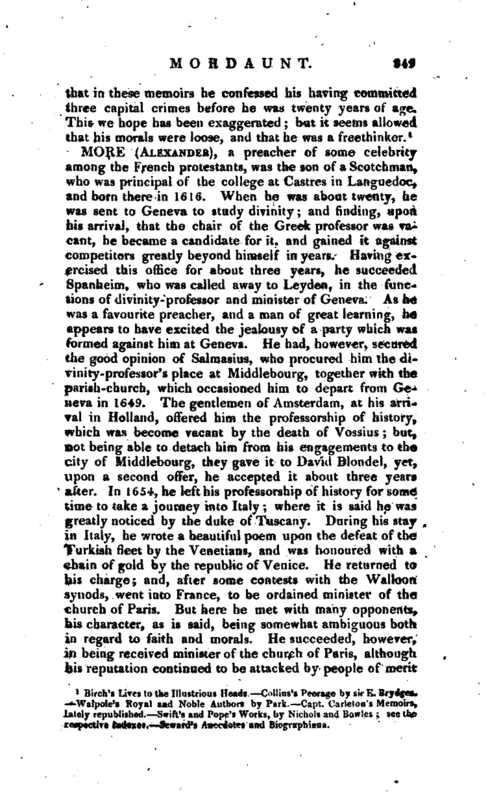 Seward’s Anecdotes and Biographjana.